The question I get asked almost more than any other is: “How do I change my own oil?”* This always makes me smile because I am eager to help those who want to get their hands dirty under the hood. So, I will attempt to help others with similar desires to discover their inner-mechanic with a quick and dirty How-To guide. 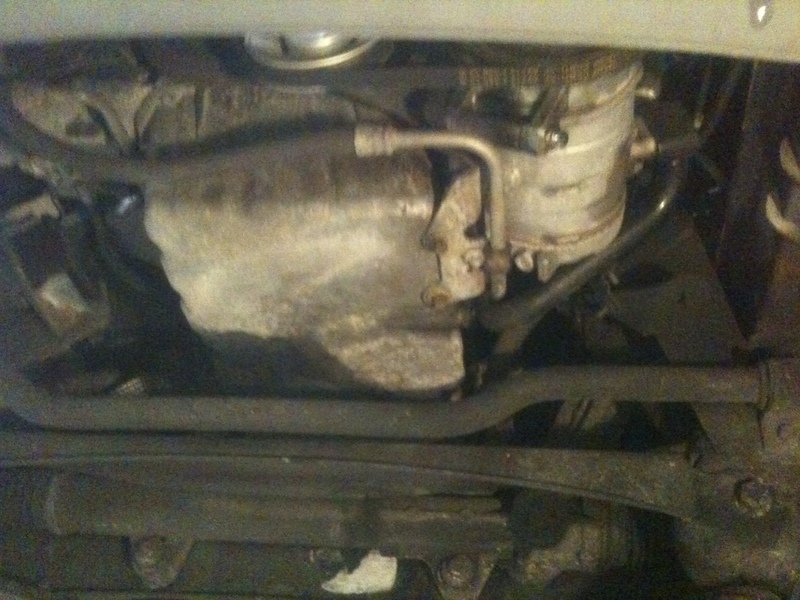 Step one is to determine if it is even necessary to change your engine oil. Answering a few quick questions should give you a good indication of just how much time you have before your next service is due. Question 1: Is your car on fire? If yes, don’t continue any further. You’ve waited too long. No? Proceed to Question 2. Question 2: Do you know how long it has been since your last oil change? If yes, great! You are a caring vehicle owner. Continue to Question 4. If no, what does the little sticker in the corner of your windshield say? If it is legible, go to Question 4. If it is badly faded, proceed to Question 3. If your windshield is not present, go back to Question 1. Question 3: Maintaining your car is essential to safe driving. Are you responsible enough to be driving a car? If yes, proceed to Question 4. If no, immediately empty the contents of your glove compartment and set fire to your car, you insufferable slob. Go back to Question 1. Question 4: Is it under the mileage interval suggested by the owner’s manual or under 5,000 miles? If yes, relax. Take a breath and keep an eye on your mileage. Your time is coming. If no, then we can move onto Step 2. The second part to this answer is: conventional or synthetic? I cannot answer this for you. However, I will say that if you can afford a good synthetic, by all means go with that. They provide better protection over a wider temperature range for a longer time than what conventionals do. Synthetics often offer drain intervals (the mileage you can drive between oil changes) far beyond that which conventionals can. Instead of changing your oil every 3,000 miles, many synthetic oils will allow you to extend this to 5,000 miles or more. (Top Tier oils can got 20,000 miles and beyond) This means long-term savings to you. The final part to this equation is: what brand? Some people are more brand-loyal than others. Some only look at performance specs. If you are the former and your father swore by Brand X and you wish to continue that tradition, then go with Brand X. If you realize that petro-chemical companies don’t know your bloodline and are more interested in how an oil performs, then go with the best oil you can afford. The logic of “you get what you pay for” tends to hold true here. A $.99/qt. oil you buy in the discount bin at the Big Box store probably isn’t a fraction as good as the $9/qt. of a Tier IV or Tier V oil (i.e. Amsoil, Redline, etc. ), but it also costs a fraction of the cost. The choice is yours. 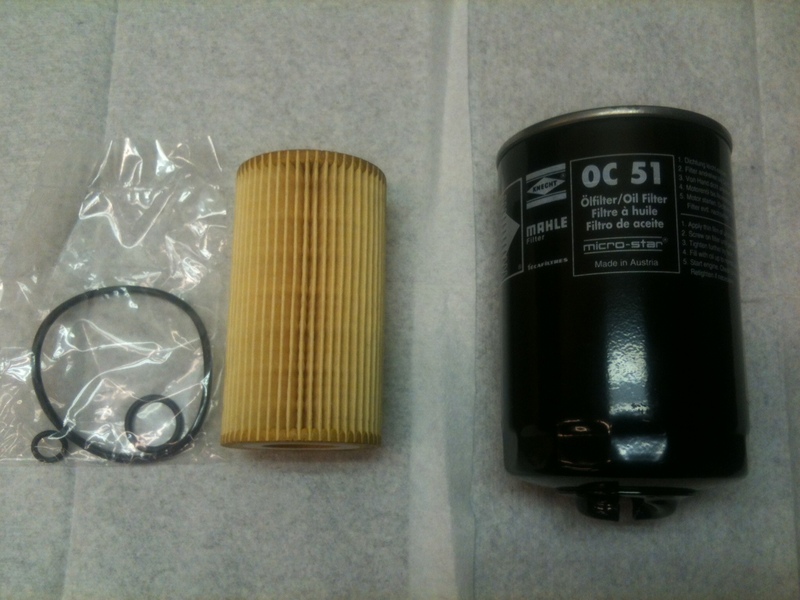 What oil filter should I buy? What other parts will I need? The only other thing that you will need is a spare crush washer for the drain plug. However, most everyone forgets this, and the factory washer gets crushed over and over again. I always use a new crush washer because a) they’re cheap, and b) I know it will be the only place on my Rover engine that is leak-free and that fact gives me a deep sense of accomplishment. If you have a cartridge-style filter, there should be a new O-ring(s) sent along. Double-check this and order a spare(s) if you can’t find it attached. You’ll need four basic tools: something to get the vehicle up in the air (other than dynamite), a wrench for the drain plug (of the proper size! 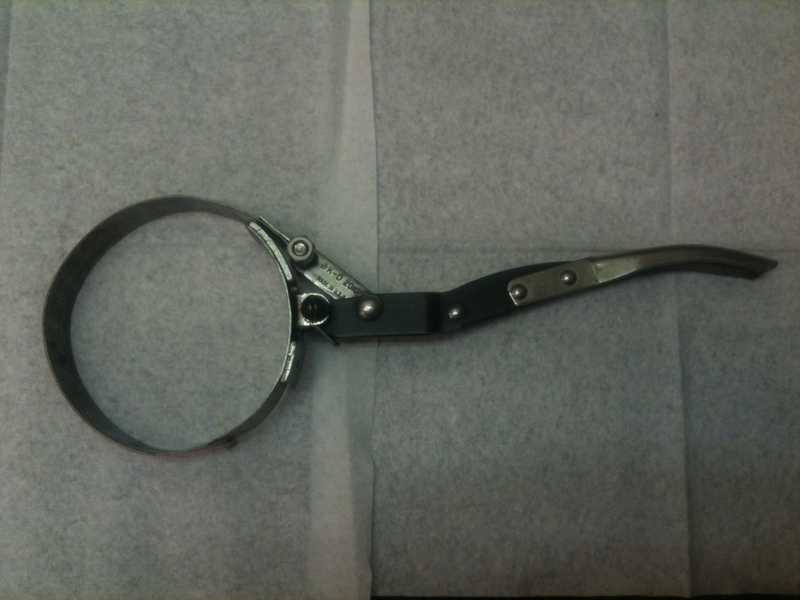 ), a filter wrench (of the proper size! ), and a catch basin for the old oil (of the proper size!). Lifting the car Get yourself a good 2-post lift, like a Mohawk or a Bendpak. If you don’t have a spare $10,000, then you will be forced to settle for a nice set of jackstands or ramps. I prefer ramps due to their ease of use and my intense dislike of things falling on me. A solid set of ramps will be quick, easy, and safe to use. A cheap set of ramps will slide everywhere when you attempt to drive onto them and always leave you wondering if spending another $10 in cost would have killed you as quickly as those shaky ramps will. Wrench for Drain Plug This will require you to crawl underneath your car and determine what size wrench is required.Any wrench brand or type will do, just make sure it is the correct size. 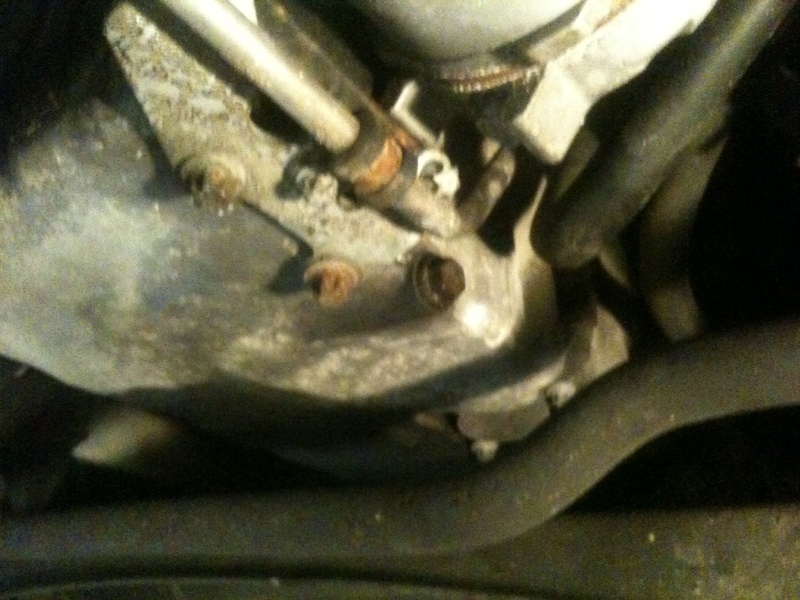 At the bottom-most part of the oil pan is a nearly-horizontal bolt. This should be your oil drain plug. Oil pan on the OM647. Drain plug has oil stains surrounding it. Now, either measure the width across the flats of the head, or try a bunch of different sizes of wrenches until you find one that fits. (this usually takes about 33 different tries for me) A proper-fitting wrench will be easy to slip on, but snug when you go to turn it. (don’t actually turn the bolt yet!!) A few degrees of free-play is normal, but ten degrees is probably too much. Alternatively, if you had to use a hammer to get the wrench on, it is too tight. At this point, it is probably easier just to buy another car. Any wrench brand or type (crescent, box, socket, etc.) will do, just make sure it is the correct size. An adjustable wrench will work in a bind, but I don’t recommend it. It’s akin to opening a bottle of wine with a hammer. It will probably get the job done, but there is a better way. Once you’ve found the correct size, write it down somewhere. A piece of tape under the hood works well for this. While you’re at it, write down the filter number, too. This info comes in handy down the road. 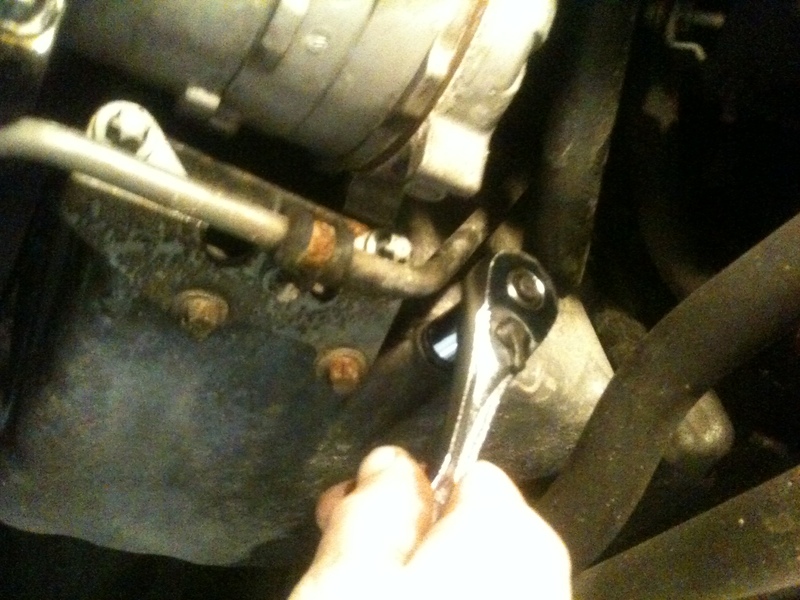 Filter Wrench Here is where it gets tricky. We will assume that your car has a spin-on type of filter. Congratulations! You have choices to remove your filter: strap wrench, band-style, end cap-style, adjustable grip-style, and a large screwdriver. If you own one car and plan on keeping it for a long time, I would suggest going with an end-cap style. They fit, they don’t slip, and they double as an ashtray. Most people use a band-style wrench with good success (by good success, I mean they get the job done while retaining most appendages), however, I find them far too easy to slip when under load on the filter, requiring the use of either an adjustable grip or hammering a screwdriver into the filter to get the filter off. With either of these last two methods, you will be destroying the old filter, so BE SURE to have the correct replacement filter on hand before you employ either the Grip, Crush & Turn or the Impale & Twist screwdriver method of filter removal. I prefer either the strap-style available from Craftsman or the adjustable grip from Griot’s Garage. -Does it have enough capacity to hold all your oil? There is a sickening feeling to drop the drain plug and see 7 quarts of oil drain into a container rated at 5 quarts. Always confirm before pulling your plug. -Can it seal up enough to transport all the dirty oil to a recycling center without puking its contents all over your (spouse’s) car trunk? An open container is never a good idea in a moving car, and transporting oil in one is no exception. No container will be leak-free, but many are close. Always take precautions by lining the trunk with newspapers and trash bags. Before we go any further we have to be sure we’ve got everything we need. The last thing you want to do is have no oil in your engine and realise you have to drive somewhere to get something you’d forgotten. –Filter Right type? You’re sure? –Ramps/Jackstands How much is your life worth to you? –Drain plug wrench Right size? –Filter wrench Right size? Right type? –Catch basin How much can it hold? –Cleanup supplies Oh, you’ll need plenty. Trust me. Paper towels and dishsoap work wonders. Got everything? Good! Now just wait until Part 2 comes out, then we can begin. ** Note of clarification: it is difficult to drive the entire trip to the store with no oil in the engine. However, there is a very good chance that you can get at least part way before the engine seizes completely and requires replacement. *** To save the guy at the parts counter from inflicting physical harm to you, ALWAYS have your year, make, model, and VIN (Vehicle Identification Number) ready. Just bring your Registration card in with you. And bring an Oh, Henry! candy bar to get on his good side. Parts guys love Oh, Henry! bars. Goof funny spin on How to Change your Oil. Thanks for sharing. For me its all about time vs. expense. A good quick oil change at a reliable service specialty shop can do it in 15 minutes and fill up all your fluids, check the air pressure on your tires and do a quick safety check on your car for $28.00. Thats not a bad deal but there is no substitute for doing your work your self. Let the ride continue! Enter your email address to follow this super-neat blog and receive notifications of new posts by email that will clog your Inbox. Jansen Herr lives in rural Lancaster County, Pennsylvania, where he spends much of his time riding obscure motorcycles, saving old European rolling stock from the crusher, and trying his best to avoid the countless Amish buggies littering the byways. Mika, his trusty Norwegian Elkhound, stands guard over the fleet to keep them safe from foxes and feral cats. In addition to the mastery displayed here on The Driving Farce, he has also appeared as guest writer for Andilit.